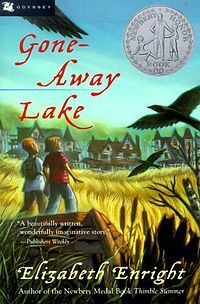 Gone-Away Lake, the first of several books about three children and their summer adventures, is an unusual children’s book. While other children’s books by Enright, such as the Melendy Quartet, stay within the bounds of ‘realism’, Gone-Away Lake delights in flights of fancy. As the children step into worlds that are so unlikely to happen, you find yourself living in another time altogether. We join the children as they step into an unlikely world of a ghost town peopled with two charming elders who live as if time had not moved on. At the same time, Enright brings all of nature into the story, so that while we are in fantasy, we are also right on earth, engaging with plants, insects, animals, and a thoroughly swampy swamp. One thing that struck me about Gone-Away Lake is that while the narrative includes lots of natural world description, there is always an edge of suspense, and possible danger lurking in each chapter. Written skillfully, it is not for children who get uncomfortable with a small amount of suspense. The tension is held just long enough to be scary, but always ends up perfectly resolved. I myself hate waiting two chapters to see, for example, if the little brother is going to get sucked up by the quicksand in the swamp. But then again, most children are more resilient than I am. The book is perfect for children between 8 and 10. Since the lead characters are a girl and her boy cousin, both boys and girls can easily relate to all of it.